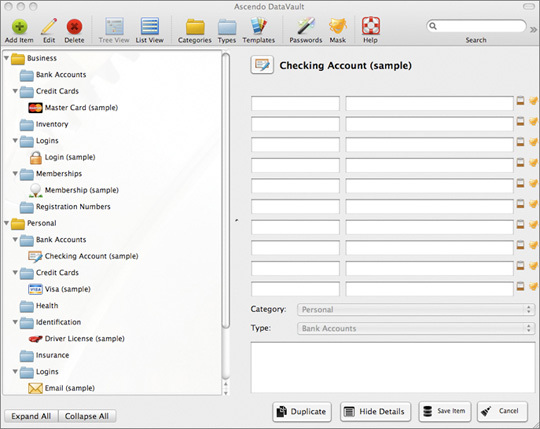 Ascendo DataVault stores confidential information about credit cards, bank accounts, logins, etc. on your iPhone, iPod Touch, iPad, BlackBerry, Mac & Windows desktops using AES, the most powerful encryption available. Ascendo DataVault provides comprehensive password management for individuals and businesses. The rich feature set includes synchronization between mobile devices and desktop computers, advanced security options, tree & list views and numerous customization settings. Unmatched features and ease-of-use have made Ascendo DataVault the best-selling password manager for mobile devices & desktop computers. Protects private information using powerful encryption and advanced security features. Saves time and money by giving you instant access to your personal information anytime you need it. Display information in Tree View for intuitive organization by Category and Type. Display information in List View to maximize the number of Items per screen. Define an unlimited number of Categories such as Personal, Business, etc. and Types such as Credit Cards, Bank Accounts, Logins, Memberships, etc. Choose from 25 pre-defined Templates or make your own, 100 icons to choose from. Customize Screen Colors and Backgrounds by selecting from 6 Themes. Generate Strong Passwords using options for Length, Letters/Numbers, Uppercase, Lowercase and Punctuation Marks. Set advanced security settings such as password masking, master password hint and security time out. Synchronize data to Ascendo DataVault Desktop (see below). Backup and restore using iTunes. For a more detailed description of Ascendo DataVault for iPhone, click here. Store your life in here! "I keep everything in DataVault - from passwords, to insurance info, to frequent flyer programs, to credit cards, to gate codes... This is an invaluable part of digital life, allowing me to maintain security (i.e. separate passwords for various sites) with access to every piece of information at my fingertips without needing to go searching or worrying about prying eyes." Display information in Tree View or List View. Expand & Collapse Tree levels. Set default Tree structure. Navigate quickly and intuitively using "Roll & Scroll"TM technology. Lookup and display Items in as few as one click. 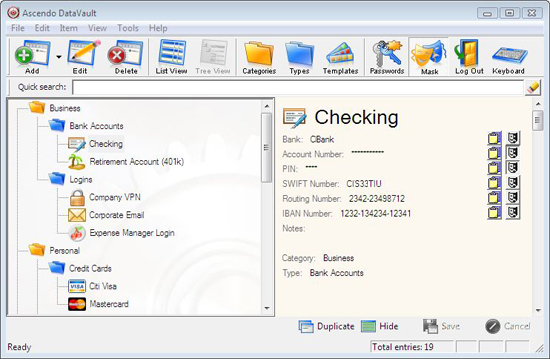 Organize Items by Categories (Personal, Business, etc) and Types (Credit Cards, Bank Accounts, Logins, etc). Use 25 pre-defined Templates or create others. Save keystrokes using short-cuts, navigation settings and Duplicate Item. Personalize user interface using unequaled number of settings. Import BlackBerry Notes and Contacts. Share Items securely by emailing or by beaming them wirelessly to another DataVault user. For a more detailed description of Ascendo DataVault for BlackBerry, click here. "The reason I did not move to a BlackBerry a lot earlier was due to my reliance on some items of software on my XDA. The most important to me being the equivalent to Ascendo DataVault. When I found Ascendo DataVault I changed my mobile type and I am delighted. I have tried a number of alternative products over circa 5 years - Ascendo DataVault is the best. Great product - highly recommended. I would be lost without it." Display Items in Tree view organized by Category and Type (see screen shot). Expand and collapse tree levels individually or simultaneously. For a more detailed description of DataVault for Mac, click here. Synchronize with iPhone & BlackBerry. Resolve conflicts when entries don’t match. Display Items in Tree View (see below). Drag & Drop Items and folders. Display Items in List View. Lookup items and edit fields in as few as one click. Use DataVault browser plug-in to automatically fill-in web forms, capture login screens, generate passwords and create desktop short-cuts for web logins. Safeguard your data with advanced settings for security time-outs, field masking and password strength parameters. Fool key-loggers with screen keyboard data entry. Customize user interface using options for fonts, colors, navigation and screen layout. Import data from CSV files and from numerous 3rd party products. Export Items to an encrypted, password-protected DataVault Exchange file (*.DVX) to share with other users. Compatible with Windows 7, Vista, XP... High resolution buttons and icons. 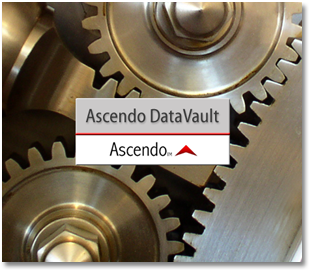 For a more detailed description of Ascendo DataVault for Windows, click here. "It really is life-changing to have an application that ensures that all of your data is in one place, is secure, and is instantly accessible... I cannot recommend this highly enough. I have had experience with similar apps on the BlackBerry and the Palm, and nothing comes even close." Apple App Store: Numerous 5-Star ratings. Handango Yardstick: Ascendo DataVault named best-selling Password Manager for BlackBerry and 5th best-selling application overall out of catalog of over 2,600 BlackBerry software titles. BlackBerryCool.com: Rated #1 Password Manager for BlackBerry. Handango: The highest average rating of any Password Manager for BlackBerry with over thirty "5 Star" ratings. To start iTunes and purchase from the App Store, click here. See FAQ for purchase instructions. To purchase from Ascendo online store, click here. See platform specific pages for other special offers, DataVault for iPhone & iPad, BlackBerry, Mac OS, & Windows.